The Takatuka Lodge is one of the next places you should visit in the Philippines. Clean – not crowded beaches, great accomodation, swimmig, diving and taking a magic rest. If this is, what you want, it is the place to go. Somehow, we have to admit, it is more of a "paradise" than Boracay Island. If you like it a bit spectacular "on the edges“ - Boracay is a great place. For peace and quiet though, Takatuka Lodge is the true place to go. 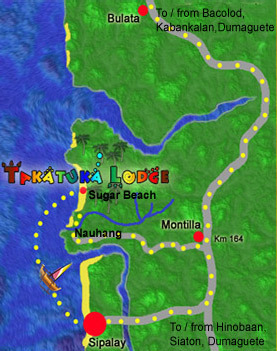 Drive south via Kabankalan and Bulata to Montilla (164 km marker, Takatuka sign on the roadside) or further to Sipalay City and follow the below described directions to the Takatuka Lodge. Drive north via Bais, Mabinay to Kabankalan, then south via Bulata to Montilla (164 km marker, Takatuka sign on the roadside) or further to Sipalay City and follow the below described directions to the Takatuka Lodge. Drive south via Siaton, Bayawan, Hinoba an to Sipalay City or further north to Montilla and follow the below described directions to the Takatuka Lodge. At the 164 km marker (Takatuka sign on the roadside), turn right at the public market and drive down the approx. 4 km long, bumpy road till the steel bridge. Park your car before the bridge.